One mixes 2 spatula-tipfuls benzoic acid with 1 ml ethanol in a test tube by swaying it back and forth (it is possible that the benzoic acid will dissolve poorly), then one adds approx. 0.2 ml concentrated sulphuric acid, and mixes again (caution!). Mount the test tube steeply but not completly vertical onto the stand. A not fully vertical mounting improves the cooling, the straight tube should if possible be directed away from oneself. Apply the rubber plug with attached tube. Gently heat for at least 2 minutes with slight reflux. Avoid overboiling! After extinguishing the burner carefully pour the mixture into the beaker filled with water. In order to remove the unreacted benzoic acid, which would otherwise seperate as a solid, one can instead of water also use a heavily diluted lye. The ethyl benzoate swims on top as an oil, one can recognize it by the characteristic odor (a basic component in the aroma of American "Root Beers"). Comment: in many lab books heating with reflux is carried out in a simple beaker, using an additional cooling tube does offer greater safety (noxious vapors, inflammation). The mixture can be discharged into the drainage. Esters which cannot be easily distilled off from the reaction mixture, can be demonstrated onhand the individual components, by heating them under reflux with acid as catalyst. Inasmuch as a quantitative yield from the ester cannot be achieved due to the regression of acid and alcohol, one uses a surplus amount of one of the components, whereby the balance is shifted in the direction of the ester. One normally uses for this the cheaper component and/or the one of less molecular weight. 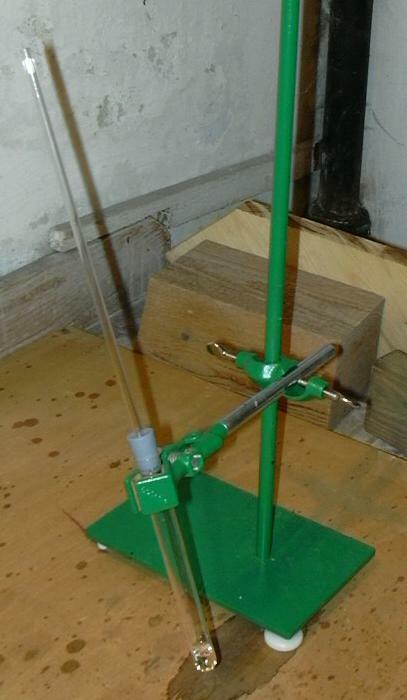 Apparatus before begin of reaction.